Q. How do I determine which filter to buy for my particular model of furnace? The easiest way to tell what type of filter you have is to look for a part number or size displayed somewhere on the filter. Most manufacturers will put their part number or nominal size on the outside of the filter for easy identification. Note: The make, model number or serial number of your furnace, air conditioning system, or air handler does NOT provide much useful information. Look for a part number or size measurements. If you cannot find a filter part number or nominal dimensions, then use a tape measure and record the exact size of the filter you are trying to replace. Find the length, the width, and the thickness. Filters are usually listed at a nominal size, which is essentially a rounded-up number. A manufacturer might print 16" x 25" x 5" on a filter, but in actuality the filter really measures 15 5/8" x 24 3/16" x 4 15/16"with a tape measure. It is normal for a filter to be undercut up to 1/2" from the nominal size. What kinds of filters are available? • Fiberglass (MERV: 2-3) is a commonly used material, but these inexpensive filters allow more pollutants to pass into the system than other materials. • Polyester/cotton pleated (MERV: 6) disposable air filters are an affordable option and provide average cleaning and removal of small particles, as long as they are replaced frequently. • Electrostatic cotton and paper (MERV: 10) provides excellent filtering properties with regular replacement. They are more expensive, but are a good option for homes with pets or smokers. • Permanent, washable filters (MERV: 8) are an affordable and environmentally friendly choice, but they may not be able to capture microscopic particles and must be cleaned frequently. 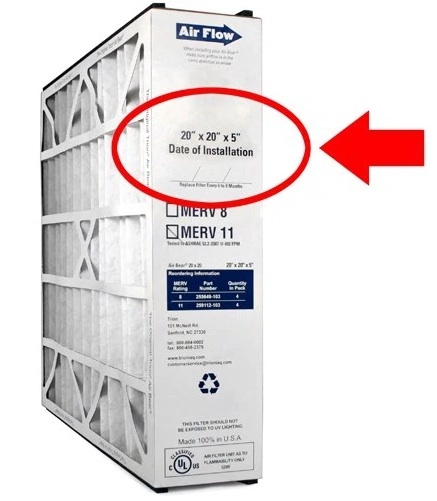 • High efficiency pleated (MERV: 13-16) air filters are the most expensive but they provide exceptional filtering capabilities and system protection. They are generally used most often in hospitals, but people with respiratory diseases may benefit from them in their homes. Please Note: Due to the thickness and air pressure needs, they cannot be installed in all systems.